Elegantly remodeled residence located on one of finest blocks in Pacific Heights. The home features beautifully proportioned grand staircase, public rooms and refined architectural detailing for gracious entertaining. Spectacular view roof terrace and garden are wonderful features of the home. The elegant FOYER introduces the exquisite parquet inlay floors, tall ceilings & doorways, wainscoting, pilasters, deep crown molding and elegant lighting found in the public rooms. The warm and inviting formal LIVING ROOM features an ornately carved fireplace and tall south facing bay windows. The elegant DINING ROOM comfortably seats a large dinner party. Two large picture windows look out to the exquisitely landscaped garden of the neighboring residence. The open BREAKFAST ROOM with corner entertainment center adjoins a deck with access to the lower level brick PATIO & GARDEN planted with fruit trees, wisteria and colorful blooms. The POWDER ROOM, guest closets and elevator off the foyer complete this level. Ascend the handsome staircase to the very private MASTER SUITE, featuring a fireplace, built-in bookcases and north view deck, along with ample his & her clothes closets and wet bar with refrigerator. The luxurious MASTER BATH has granite and marble surrounds, double vanities, spa tub and glass enclosed shower. The sunny front BEDROOM looks out to the pretty tree-lined street. The adjoining BATH with marble surround features a spa tub and glass enclosed shower. The middle BEDROOM has an adjoining tiled BATH with deep tub and shower. The spacious FAMILY/MEDIA ROOM with fireplace, small deck and bay view is perfect for casual entertaining and family time. Stairs lead to the fabulous view roof terrace. 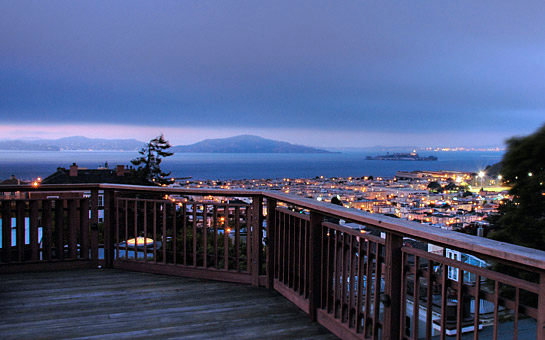 Stairs lead to the fabulous VIEW ROOF TERRACE with both Bay and City vistas. The fourth light and bright BEDROOM & BATH with shower completes the third level. Prospective Buyers are advised to review, prior to any offer, the “Seller’s Disclosure Package" available on request. Taxes will be reassessed upon the sale to approximately 1.141% of the purchase price. The 2 CAR GARAGE, AU PAIR/REC ROOM, half bath, laundry room, and utility room can be accessed via the elevator, trades entry or patio/garden.